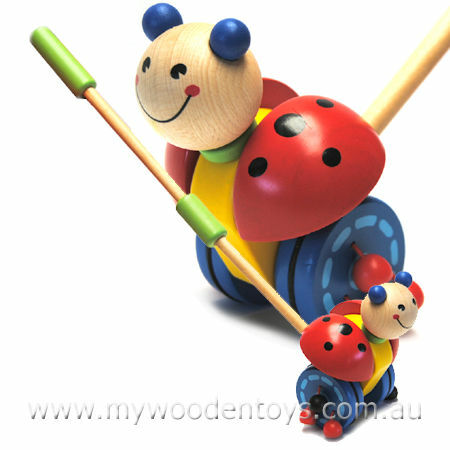 Wooden Pushing Lady Bird flaps its wings and rattles its wheels as you push it along by its removable handle. This pretty Pushing Lady Bird has a big smile and rubber inserts on its wheels so it won't slip on a wooden or lino floor. A clever design the ladybird has a detachable handle so it can be stored in a small space. A great push and walk toy for those early walking adventures. Size: Bug is 14cm high x 15cm wide wingspan. The handle is 43cm high. We like this because: "Nice and bright and the beads on the wheels make a nice rattling noise."